Congratulations to Roy on his selection as our Featured MX5 Miata! 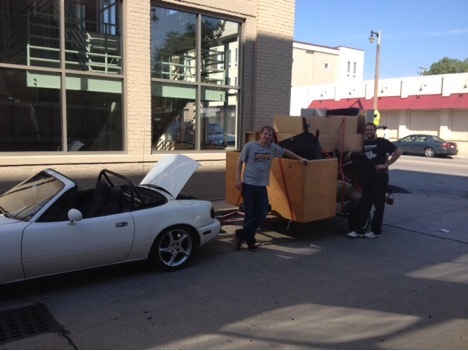 This is a story about; doing amazing things with surprisingly little, a little trailer and its unlikely partner, and how the Miata is not only the greatest car ever made, but possibly the most versatile. I got my first Miata when I was sixteen more than a decade ago (wowza) and I've been a part of the Miata community ever since. I have become the typical Mazda fanboy having owned an RX-8, Mazda3, and a 323 GTX former Pro Rally Car which I hope to restore to its former glory. My first Miata was eventually honored with Miata of the Month: see MOTM June 2006: and I still proudly display its hood in my office. 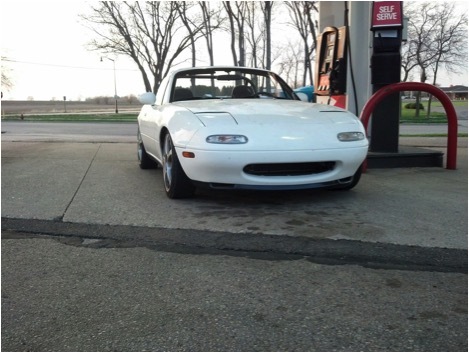 The Miata is a special car to me and has been a big part in my life. I've owned about thirty (30) Miata's since my first M1 turned Spec Miata, but my most prized is my 1991 Crystal White, affectionately named Frank, which I purchased about 6 years ago. I am one who strongly believes that Miata's were meant to be driven often and driven hard. I expect Frank to stand the test of time and plan on handing the keys to my son on his 16th birthday (about 14 years from now), but make no mistake in thinking this Miata will have it easy. Beyond the usual enthusiast driving and track days, this Miata has an interesting double life. Equipped with a hard dog hidden trailer hitch and paired with a 5' x 8' utility trailer, Frank has become the general purpose hauler for my family and close network of friends. 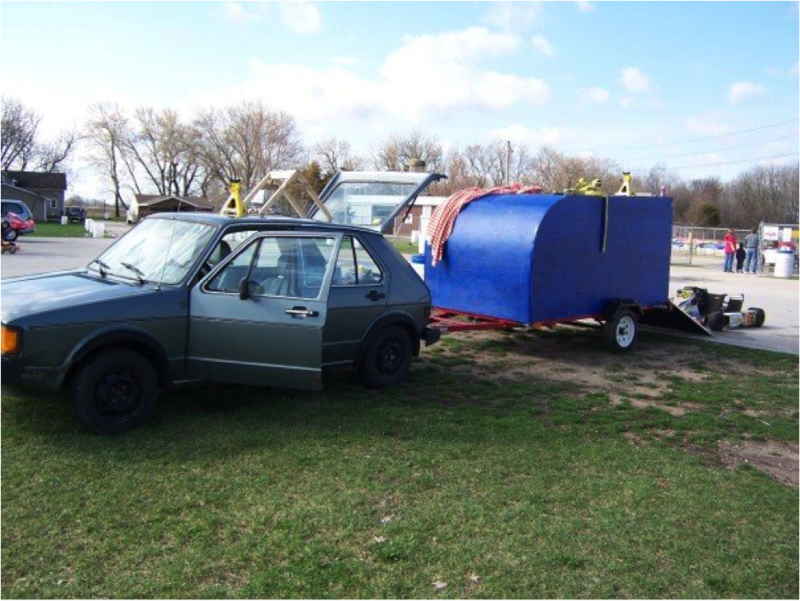 This trailer, nicknamed "The Bean" is Franks's partner in crime, is a Frankenstein built from; a harbor freight kit, a custom 5' axel, and a bunch of 2x4's to fit the new 5' wide frame. The Bean started its life as a mini-enclosed trailer for my shifter cart. Unfortunately, after breaking my ribs during my first kart outing, it didn't get much use. Once the shifter was sold, "The Bean" ended up losing it's top to become a general purpose utility trailer. The Bean has also seen some miles. 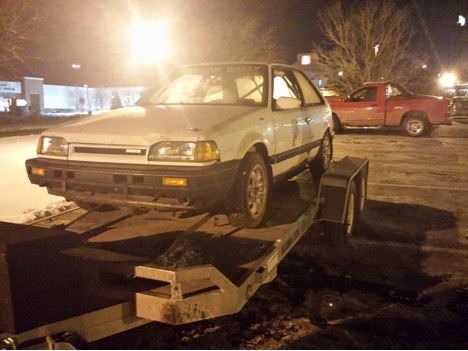 Beyond the standard tow projects, this little guy traveled across the country and survived literally getting run over by a brick delivery truck. "You tow with that little car?" and the obligatory response, "Damn right!" 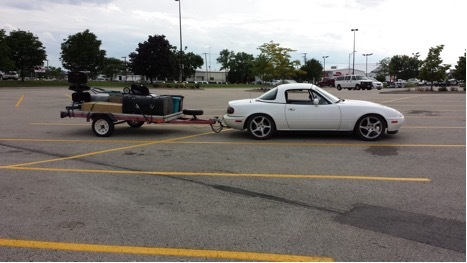 Not only can the Miata tow but it does a very good job! With a low belt line and a drop top, you can't beat the visibility. The brakes are solid and with short transmission gearing, it's no trouble stopping or accelerating. 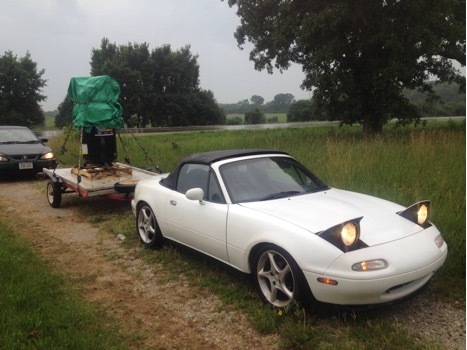 The best part of towing with a Miata is zipping past one of the jack-hats rolling coal in their monstrosity of a truck, knowing full well that you will tow more than them that year.The Miata's nimbleness, reliability, and ability to put a smile on anyone's face is a widely accepted fact, but a more important feature I feel is lost, is the versatility of this car. 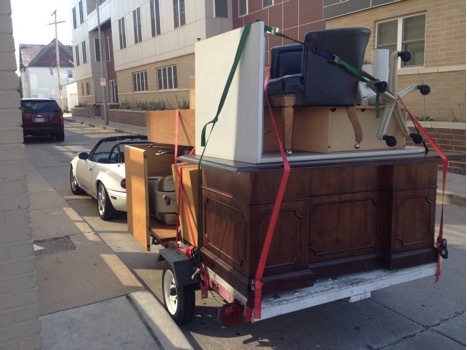 It's difficult to think of another car that can match the extreme range of the Miata with the ability to illicit the Joy of driving while still being able to haul a living room set.